Greek: Lasiurus - "hairy tail." Latin: cinereus - "ash-colored." Fur: Yellowish to brownish with frosty (hoary) appearance; hair - broad cream/ tan band, narrow blackish, subterminal band, whitish tip. Tail membrane: Completely furred dorsal surface. Wing membrane: Brownish-black, yellowish along forearm; white patches at elbow and wrist. Ears: Relatively short (19 mm); edged with black with whitish patches; rounded tip. Tragus: Less than one-half ear length; blunt tip; curved forward. Other: Whitish wrist and shoulder hair patches: top of feet and ears furred. Total length: 130-149 mm. Forearm: 46-58 mm. Wingspan: 380-410 mm .. Total weight: 15-35 g.
Silver-haired bat (L. noctivagans): Smaller size «20 g) and shorter forearm «46 mm); black color; lacks fur on feet, ears and terminal part of tail membrane; Incisors 2/3. 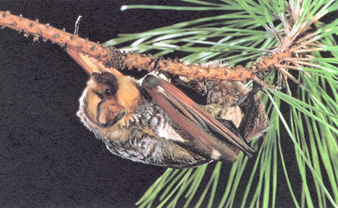 Red bat (L. borealis): Smaller size «15 g) and shorter forearm «46 mm); reddish color. Overall: North America from central Canada to southern Florida and Guatemala. 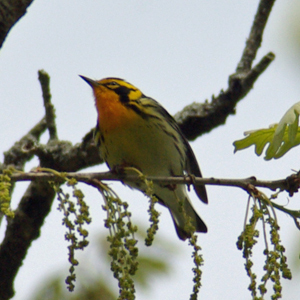 Iowa: Females found statewide in summer; adult males rare except during migration. Primarily a solitary resident of the deciduous forests, the hoary bat is known to roost at least 3-5 m above the ground in dense foliage of trees and shrubs, sometimes in urban areas. Although it is the largest of Iowa's bats, this species is rarely encountered by the casual observer. If found, it is usually a female with young attached, probably blown or knocked from its tree roost during a summer windstorm. Adult males are thought to migrate through Iowa northward or westward since few have been found here during summer months. Probably all individuals move southward to overwinter. However, the large size and thick fur, plus cold weather records elsewhere in the Midwest, suggest the possibility that a few may spend the winter in Iowa. 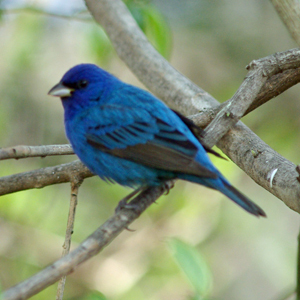 At least some individuals mate during the fall migration, although details of reproduction are not well known. In Iowa, from one to four young are born after females return to their summer range, with birthing occurring from mid-May to early June. The earliest born young begin to fly by late June. The hoary bat is a faster, more direct flier than most bats in Iowa and shows a peak of foraging activity later in the evening. Stomach analyses indicate a wide variety of insects are eaten including: beetles, flies, grasshoppers, termites, dragonflies, wasps, moths and mosquitoes. This species has a statewide distribution and does not appear to be in danger of extirpation. However, as with any predominately forest-dwelling bat, continued decline of forest habitat could seriously decrease its population or restrict its distribution in Iowa.